We live in an increasingly global, interconnected, and interdependent world, in which various forms of systemic imbalance in power have given birth to a growing demand for genuine pluralism and democracy. 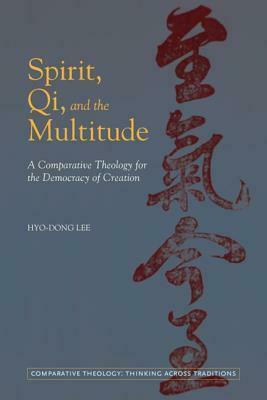 As befits a world so interconnected, this book presents a comparative theological and philosophical attempt to construct new underpinnings for the idea of democracy by bringing the Western concept of spirit into dialogue with the East Asian nondualistic and nonhierarchical notion of qi. The book follows the historical adventures of the idea of qi through some of its Confucian and Daoist textual histories in East Asia, mainly Laozi, Zhu Xi, Toegye, Nongmun, and Su-un, and compares them with analogous conceptualizations of the ultimate creative and spiritual power found in the intellectual constellations of Western and/or Christian thought-namely, Whitehead's Creativity, Hegel's Geist, Deleuze's chaosmos, and Catherine Keller's Tehom. The book adds to the growing body of pneumatocentric (Spirit-centered), panentheistic Christian theologies that emphasize God's liberating, equalizing, and pluralizing immanence in the cosmos. Furthermore, it injects into the theological and philosophical dialogue between the West and Confucian and Daoist East Asia, which has heretofore been dominated by the American pragmatist and process traditions, a fresh voice shaped by Hegelian, postmodern, and postcolonial thought. This enriches the ways in which the pluralistic and democratic implications of the notion of qi may be articulated. In addition, by offering a valuable introduction to some representative Korean thinkers who are largely unknown to Western scholars, the book advances the study of East Asia and Neo-Confucianism in particular. Last but not least, the book provides a model of Asian contextual theology that draws on the religious and philosophical resources of East Asia to offer a vision of pluralism and democracy. A reader interested in the conversation between the East and West in light of the global reality of political oppression, economic exploitation, and cultural marginalization will find this book informative, engaging, and enlightening.